Architectural Encounter Label. Photo: Lauren Meranda. 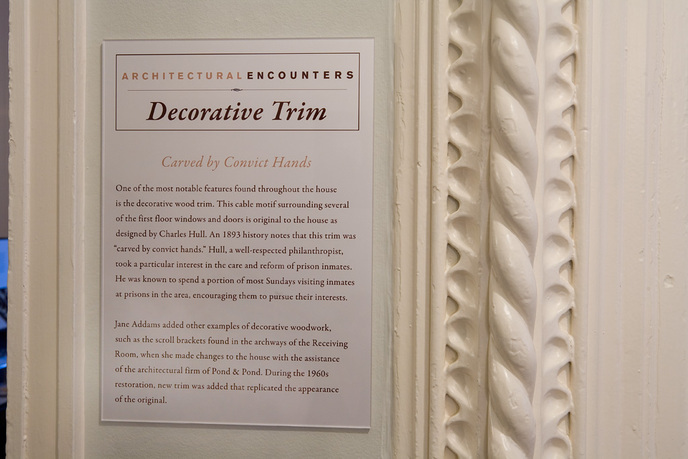 Hull-House Museum has developed, produced, and distributed a fifty-page catalog for the exhibit Architectural Encounters. This beautifully designed monograph includes high-quality images of twelve important architectural features from the nationally landmarked Hull Home and Residents' Dining Hall, founded by Nobel Prize-winner Jane Addams and her colleagues. Essays by prominent scholars investigate the relationship between the Settlement's built environment, design aspects, and social ideals; while a public panel discussion engages audiences in these issues. 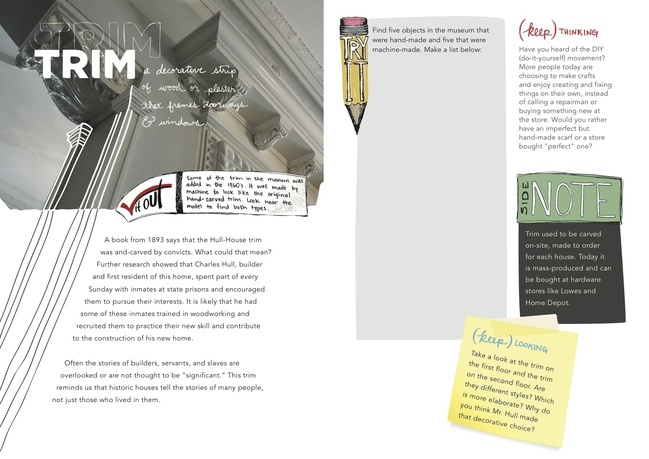 Project goals are: 1) contribute to a better understanding of the evolution of Hull-House through the perspective of architecture and the designed environment; 2) provide critical insights into the process by which architecture and urban design can become agents of social change and collective discourse, while contributing to pluralism and democracy; and 3) engage the public in critical dialogue about these issues. Lisa Yun Lee is visiting curator at of the Jane Addams Hull-House Museum and director of the School of Art and Art History at the University of Illinois at Chicago. She has spent the last decade advocating and creating public spaces for conversations on critical cultural and social issues, and she is cofounder and former director of the Public Square. She is the author of Dialectics of the Body: Corporeality in the Philosophy of Theodor W. Adorno (Routledge, 2005); recent articles include works on democratic museum practices, creating counter publics through public programming, and social justice pedagogy. She holds a PhD in German studies from Duke University. She serves on the board of trustees of Ms. Magazine, Young Chicago Authors, the Public Housing Museum, the Chicago Symphony Orchestra, WBEZ Chicago Public Radio, and the Chicago Children's Theatre. Weston Davey is the preservation specialist and facilities manager at the Jane Addams Hull-House Museum. A graduate of the historic preservation program at the School of the Art Institute of Chicago, his experience includes historical research, archeology, and building investigation and restoration techniques. He produced Architectural Talking Points for Hull-House Tours, a guide for museum educators linking interpretation of Hull-House architecture to the Arts and Crafts Movement, immigration, gender, and class. Davey has worked on restoring a Frank Lloyd Wright-designed home in River Forest, Illinois, and interned for Landmarks Illinois, a preservation advocacy group based in Chicago. Jane Addams Hull-House Museum is a unit of the College of Architecture and the Arts at the University of Illinois at Chicago (UIC), and serves as a dynamic memorial to social reformer and Nobel Peace Prize-recipient Jane Addams (1860-1935) and other resident social reformers whose work influenced the lives of their immigrant neighbors, as well as national and international public policy. The Museum preserves and develops the original Hull-House site for the interpretation and continuation of the historic settlement house vision, linking research, education, and social engagement. Founded in 1889 as a social settlement, Hull-House played a key role in redefining American democracy in the modern age. Hull House Association, which continues as a social service agency, left the original site in 1963. Hull-House Museum opened in 1967 as a unit of the new UIC campus. The Museum and its programs make connections between the work of Hull-House residents and important contemporary social issues.